Photo manipulation: JM Navarro is a creative art director from Spain. His photo manipulations are a visual treat to the eyes. According JM Navarro, "Visual Poetry Mixing concepts, images and colors makes me happy". Using simple objects like knife, carrot, axe, the pictures are photo manipulated into something else. We loved the carrot knife, hand shake gun, aero pen and the stunning heart sipper. 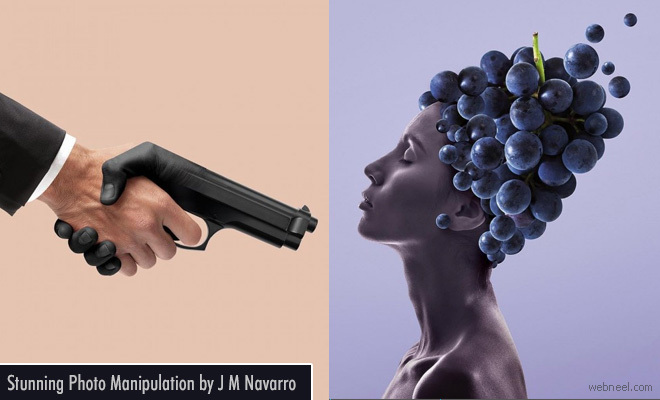 JM Navarro's creative photo manipulation ideas look so realistic. Each photo has a story to tell, like for instance the axe cuts down trees, but the axe is shown with a branch with a leaves. It's like as if the artist is making us aware of the nature. Imagine a person handing clouds as a bouquet of flowers? It's an interesting concept and makes us smile.